Located in Downtown Minneapolis, this cabin is within a 15-minute walk of Minneapolis Institute of Arts and Walker Art Center. Minneapolis Convention Center and Nicollet Mall are also within 1 mi (2 km). Nicollet Mall Station is 28 minutes by foot and Warehouse - Hennepin Station is 29 minutes. Located in Downtown Minneapolis, this cabin is within 1 mi (2 km) of American Swedish Institute, U.S. Bank Stadium, and Minneapolis Convention Center. Nicollet Mall and Guthrie Theater are also within 1 mi (2 km). Franklin Station is 15 minutes by foot and Metrodome Station is 18 minutes. Situated in Minneapolis, this cabin is 1.6 mi (2.5 km) from Minnehaha Park and 2.2 mi (3.5 km) from University of St. Thomas. University of Minnesota-Minneapolis and U.S. Bank Stadium are also within 6 mi (10 km). 38th Street Station is 24 minutes by foot. Located in Downtown Minneapolis, this cabin is within 1 mi (2 km) of American Swedish Institute, U.S. Bank Stadium, and Minneapolis Convention Center. Guthrie Theater and Minneapolis Institute of Arts are also within 1 mi (2 km). Franklin Station is 14 minutes by foot and Metrodome Station is 16 minutes. Situated in Minneapolis, this cabin is within 3 mi (5 km) of Lyndale Park, Minneapolis Convention Center, and Minneapolis Institute of Arts. Walker Art Center and Nicollet Mall are also within 3 mi (5 km). Does the thought of waking up in a plush bed, stepping out onto a private patio, and taking in views of the lovely surroundings sound like exactly what the wise wanderer ordered? Then it might be time to peruse cabin rentals in Minneapolis. Whether you’re looking for a log cabin to host your weekend of solitude, or are curious about one of many luxury cabin rentals to host you and your special someone, Travelocity has everything you need for your next vacation. Travelers have always appreciated Minneapolis for its natural wonders, and now you can too. Spend your days exploring all the area has to offer, from its scenic trails near your accommodation to quirky boutiques and delicious restaurants in town. Wake up early for a sunrise hike, go fishing at a nearby lake, or sleep in and find a shady tree to read under in the afternoon. There’s no right or wrong way to experience the outdoors, but there are tons of cabin rentals that will let you enjoy them more thoroughly. Even if your plans include roughing it while you’re out hiking during the day, you don’t need to shy away from enjoying the many amenities available at cabins in Minneapolis. Reserve a cabin with a spa tub for ultimate relaxation, or book one of many appealing cheap cabins that’s located near breweries and restaurants. 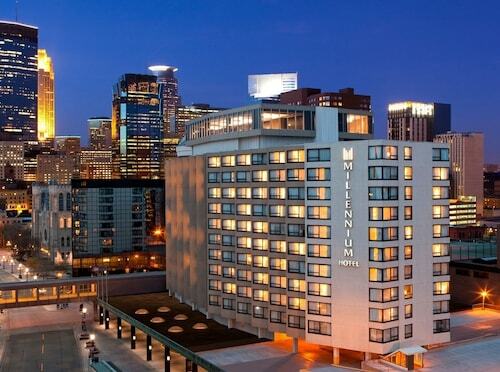 Confirm your hunch—that Minneapolis is the perfect place for your next getaway. Reserve a cabin with Travelocity, and get ready to explore the area to your heart’s content. Nature’s calling, and the best way to answer it is from inside an inviting cabin.